St. Thomas Aquinas Catholic Church - Bronx, N.Y. The Roman Catholic parish of St. Thomas Aquinas can trace its roots to October 1876, when the first Mass was celebrated in Ray's Hall in the village of West Farms, by Rev. John J. McNamee, a young priest recently appointed by Cardinal McCloskey as pastor of St. Augustine's parish in Morrisania. Services continued at this hall until 1883, when five lots on the northeast corner of Tremont and Bryant Avenues were purchased for $3,500 by Rev. Michael Nolan, Father McNamee's successor. On these lots was built a brick church seating 260, at a cost of $6,000, that was the first church dedicated by Archbishop Corrigan in the diocese. Masses and a Sunday-school were administered by a priest from St. Augustine's until 1889, when West Farms was established as an independent parish, and Rev. Denis J. McMahon, D.D., was appointed pastor. 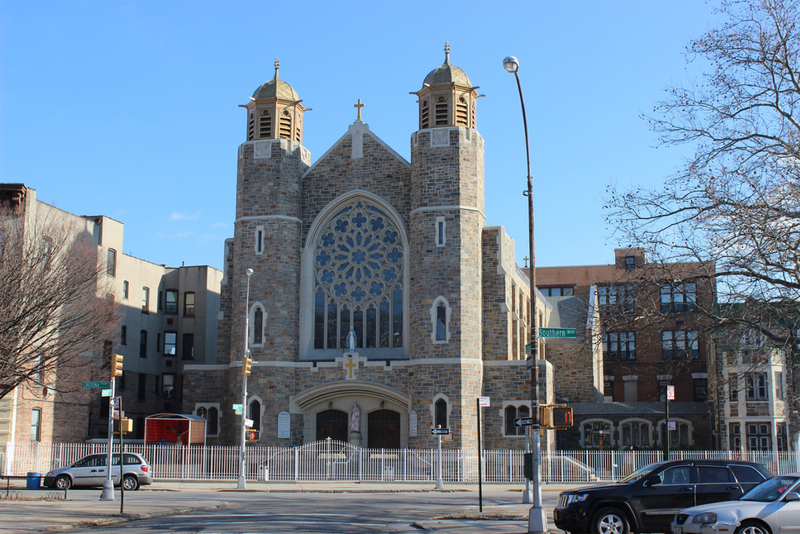 Father McMahon built a rectory costing $5,000, renovated the church, and established missions in Hunts Point and Bronxdale. In the early 20th century, big changes came to the area with the opening of the new subway to West Farms and the extension of the Third Avenue Elevated Railway. Rev. Charles H. Parks, successor to Father McMahon (and widely known as the first Catholic chaplain of the U.S. Navy), envisioned that a larger church would be needed, and in February 1903, he purchased five lots on Crotona Parkway with five adjoining lots on Daly Avenue for $16,000. In January 1906, construction began on a four-story building that would house both the church and school. Father Parks died in March 1907, before the lower stories were completed. Under the leadership of the next pastor, Rev. Denis F. Coyle, it was decided to put a roof on the incomplete building to avoid increasing the existing debt of $86,500. In September of that year the school opened, with 38 pupils under the care of three Sisters of the Sacred Heart of Mary Immaculate. In October, the Panic of 1907 occurred, paralyzing the growth of West Farms. As a cost-saving measure, the old rectory was moved to the new property at a cost of $3,000, and the old church on Tremont Avenue was closed and put up for sale. For the next two years the church struggled to pay interest on the debt and support the school. In 1910, two lots on the south side of the church were purchased for $9,000 in order to preserve light and air. In 1912, work resumed on the school building, and it was completed in 1914. The school had grown to 650 students, with seven Sisters and six lay teachers. At that time, the parish membership numbered 3800, and attendance at Mass was about 2800. 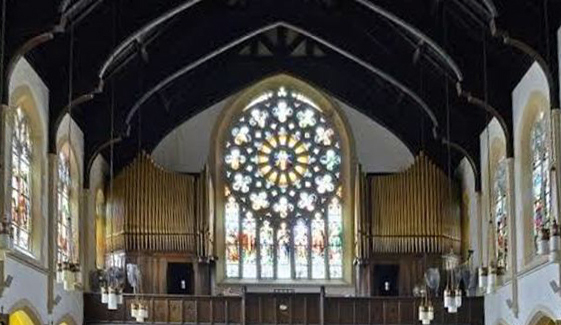 The present church building was designed by Thomas Dunn in the English Gothic style. It was dedicated by Cardinal Hayes on November 22, 1925. The Factory Specification, dated November 10, 1924, shows that this organ had a detached, two-manual stop-key console, casing of white oak and display pipes decorated in gold bronze. Wind pressure was 5". Built at a cost of $9,000, the organ was to be ready for use on or before Easter Sunday 1925. Organ Historical Society Archives. Factory Specification of M.P. Möller organ, Op. 4173. Courtesy Bynum Petty. Kiernan, Matthew X. Exterior (2015). © Matthew X. Kiernan/New York Big Apple Images. Used by permission. St. Thomas Aquinas Church website. Interior view from altar toward organ.